Following are Clarinet Exercises with Clarinet Left Hand Position tutorials to improve your technique and speed. The videos are meant for you to practice with Chris as he discusses the left hand and then demonstrates in further videos. E LOOP Left Hand Position is the beginning of a three part series. On this video we take a short excerpt of The Flight of the Bumblebee from Chris' book Bumblebee Loops. Chris explains clarinet left hand position as it relates to this loop starting on first line E.
On this exercise practice the E LOOP from #Bumblebee Loops in eighth notes from MM 100-200. On this clarinet exercise practice the E LOOP from #Bumblebee Loops in sixteenth notes from MM 100-200. This clarinet tutorial addresses the clarinet left hand position as it relates to the A LOOP in #BumblebeeLoops This is one of three videos discussing the left hand position first and then practicing the exercise from eighths at 100-200 to the third video practicing sixteenths 100-200. On this clarinet exercise practice the A LOOP from #Bumblebee Loops in eighth notes from MM 100-200. If you find this video first, look at video A LOOP 1 Left Hand Position also on @clarinetnow youtube channel. This video is a practice video and meant for you to play along with Chris. On this clarinet exercise practice the A LOOP from #Bumblebee Loops in sixteenth notes from MM 100-200. If you find this video first, look at video A LOOP 1 Left Hand Position and A LOOP 2 practice eighths 100-200 also on @clarinetnow youtube channel. This video is a practice video and meant for you to play along with Chris. 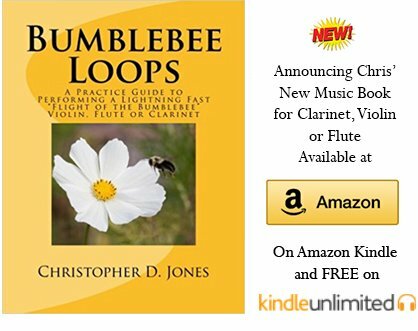 For all of the videos above you can find the exercises in Bumblebee Loops by Christopher Jones here on Amazon.com. Again, these videos are intended for you to practice with Chris. Look at the clarinet left hand position videos with your clarinet and a mirror nearby to see if you are doing any of the proper or improper movements of fingers or the left wrist. If so, work on those with these exercises. Then, with the repetition videos, make sure you get your Clarinet Now to practice with Chris. Take the proper rests in between each metronome notch movement, and then play. If you are currently unable to make a certain tempo, stop playing, mark that tempo, and then back up the metronome and practice the slower tempo for a few weeks or months. Then, try to move up the metronome again and see how fast you made it smoothly and evenly.